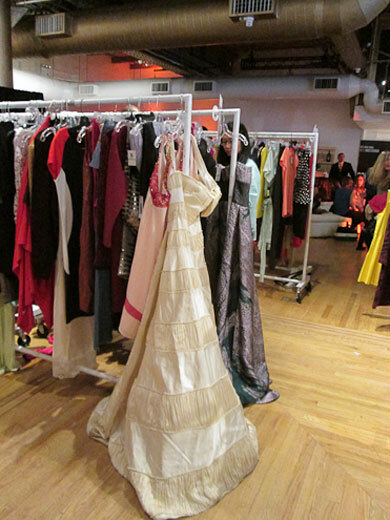 Yesterday was Gilt City’s shopping event, #raidourwarehouse in the lower Chelsea/Flatiron neighborhood. Taking place on the ground floor of the Altman Building, women, men, and children all gathered to stake their claim on discounted designer goods. This was a large event, with probably 100 or more people browsing at once, and led to very long dressing room lines, along with a long line at the bar. However, if you do not try on clothes or drink, you would have been pleased to not wait on line or to check out. Checkout was a little strange, with credit card transactions only. I suppose it is easier to not handle cash, but it seems absurd to not be able to PAY with cash, especially at an event that had an entry fee. Upon chatting with shoppers, reviews were very mixed. The men’s selection was rather exceptional, and the few men that were smart enough to come were leaving with huge bags of high end shoes and clothing. Some male guests even came without the insisting of a female, which is extremely rare for any large sale, meaning they know they are onto something. Women’s selection was very very mixed. 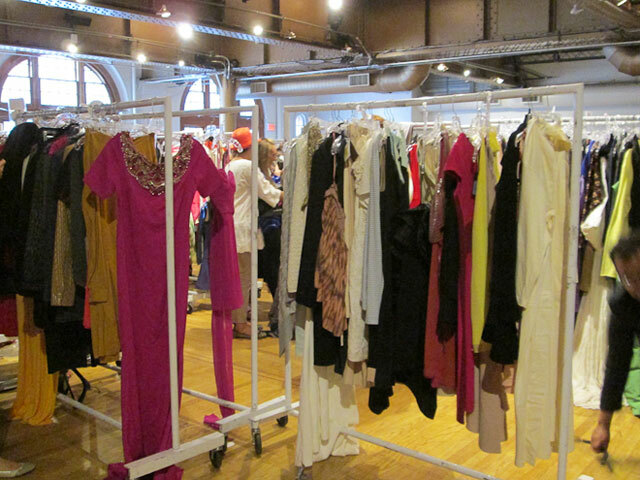 Most pieces were one-off, we didn’t see a lot of size or color variation for specific items, making it a lot more reminiscent of a proper sample sale that isn’t just liquidating back-stock. The item that seemed the most worth looking at was the evening gown. In my opinion this would be the only thing to save this sale, coming for a lower priced designer name gown or dress. Everything else was just…strange. The selection reminded me of a higher end T.J. Maxx or Loehmann’s but without the good lighting so you could actually see what you were buying. Between the poor lighting and overabundance of cream colored threads, some ladies we asked were very upset at the selection, feeling cheated out of $10. 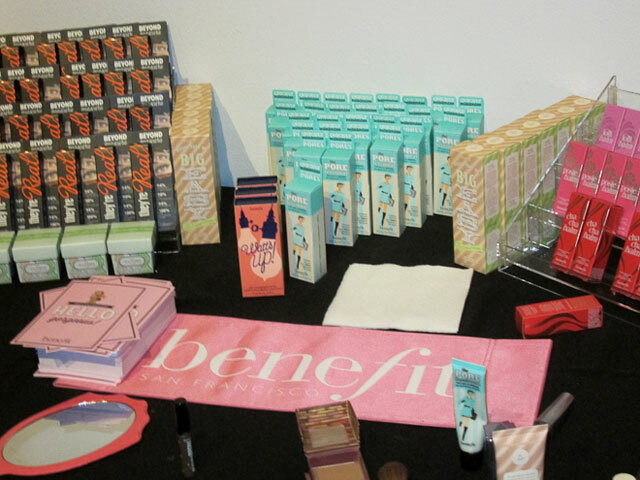 At least there was music, complimentary cocktails, and a Benefit Brow Bar. Ladies from the well known and fabulous cosmetic company were on hand to perform eyebrow shaping and product consultation. 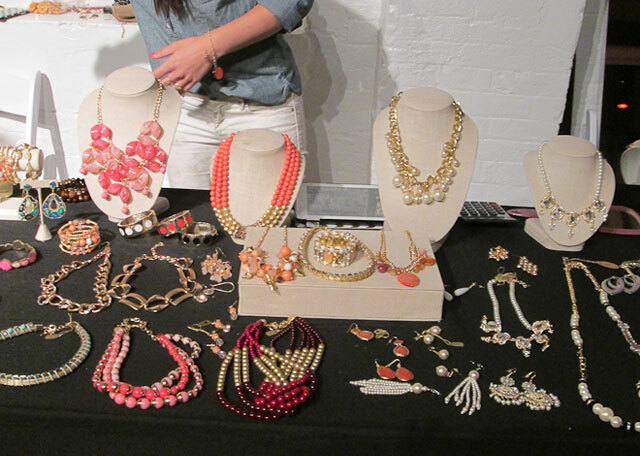 There was also a jewelry designer with a table near the DJ booth, offering up bold statement pieces at decent prices. Come for the party, stay for the ballgowns is our verdict, as prices were not as low as to be expected at this event. 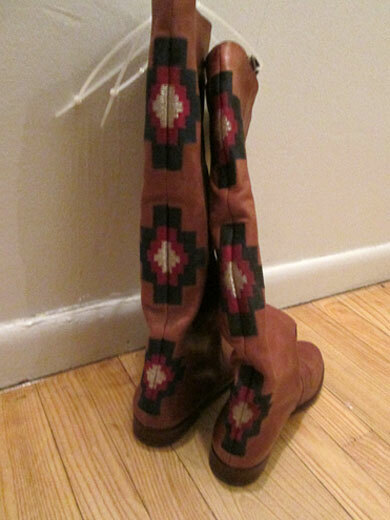 Women’s shoes were a bit of a disappointment, with vinyl boots for $69.95, far too high for leather, and designer styles for $195, not much cheaper than the ol internet. Purses and lingerie were an absolute mess, so unless you feel like paying $10 to shop like its Christmas time or perhaps you are at a salvation army, skip. High end thrifting seemed to be the feeling here, with disposable income being just that, disposed of.